In 2015 I reviewed the Noontec Zoro II HD (https://headfonics.com/2015/09/the-zoro-2-by-noontec/). I concluded that the sound quality is very good, but I had some issues with the glossy plastic that not only resembled the Beats headphones but also made me worry about the build quality. I finalized with: “I am very interested to see what Noontec can do if they actually try to create a new design and if they use better materials. I am putting this brand on my watch list and so should you!” So here we are in early 2017 and Noontec did just that what I hoped for. Zoro II: The Z2VC is based on the Z2’s dynamic driver with the same enjoyable tuning. Wireless: The Z2VC uses Bluetooth 4.0 with aptX support for just 100 bucks extra. Volcanic Rock: Noontec used highly durable ABS plastic, hence the name. 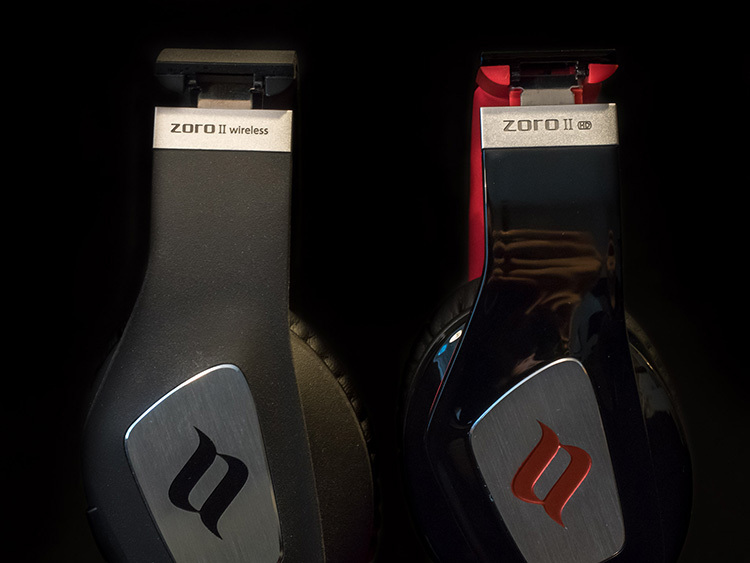 Limited Edition: The Z2VC headphone is limited to 500pcs. So after you finished reading this review, I suggest to quickly place an order! The headphones come shipped in a consumer-friendly white cardboard box with branding and glossy product photo. It’s clean and simple. Feature logos, as well as a sticker reminding you of a limited edition, have been moved to the side. The back has a multi-lingual description with specifications. The main accessory here is the travel hard case with printed carbon fibre design. It is spacious enough to just fit in the headphones and the two additional cables. The previously released Zoro 2 did not come with a hard case but a velvet pouch. This is another step in the right direction for Noontec. A 3.5mm terminated stereo cable and a MicroUSB cable for charging are included and have their separate (removable) compartment in the travel case. 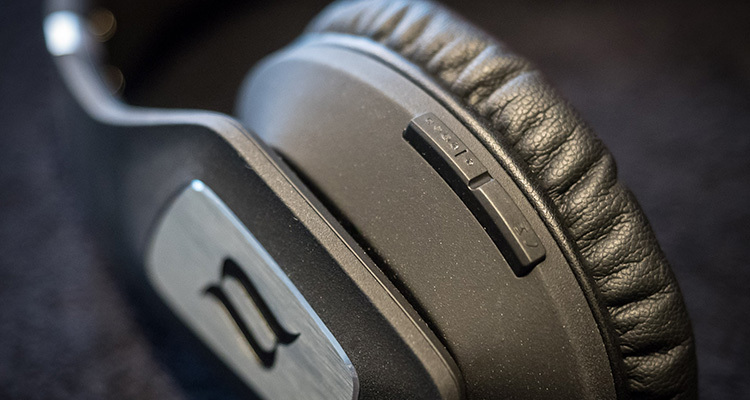 Ever since I reviewed the Final Sonorous III headphone, I have been a big fan of ABS plastic. This form of material can be extremely durable and in some cases, when the surface is polished flat, it is nearly indistinguishable from metal aside from the warmth. In case of the Z2VC it has a rough texture that feels very grippy and creates a great contrast to the very soft headband padding. The Noontec logo on the headband seems to be printed on but it resisted my attempt at scratching it off with my fingernails. On a closer look, I thought the corners of the logo were starting to peel off, but as it turns out, there were just small remains from the cuts. I took a dry sponge to swipe over the logo and after it looked smoother with better defined edges. To be fair, I don’t think many people look as closely as I do. Thanks to the portable design, the wings fold in from the side to the center. This time around, the joints snap beautifully into place or out of position; a big improvement over the Z2HD I reviewed previously. Gone is the screeching noise. Aluminum accents pop out from the overall dark plastic. The black Noontec logo contrasts a brushed metal surrounding and this time the logo is colored precisely. The ear cups have more room to swivel and this helps the comfort a lot. 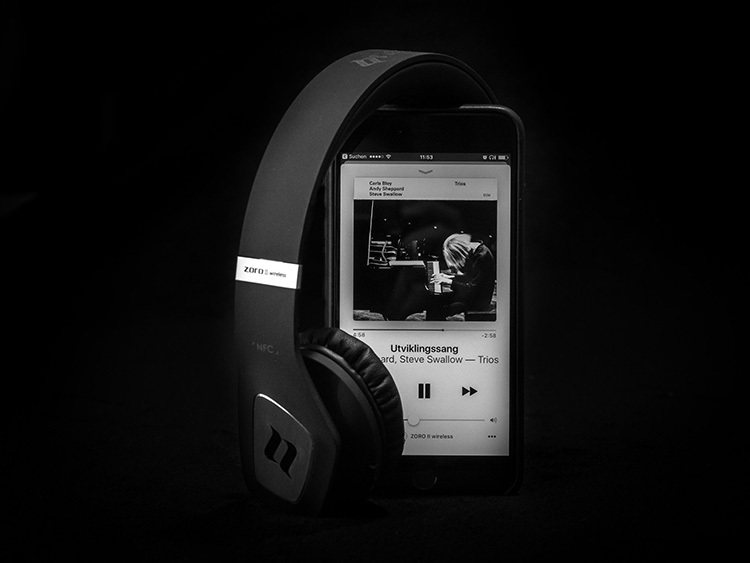 On-ear headphones always have the issue of distributing the pressure on the ears evenly. I would not necessarily say that the Z2VC is the most comfortable set of on-ears ever, but I had no issues to wear them for several hours a day. I am very impressed by how much Noontec improved the build quality since the last review. 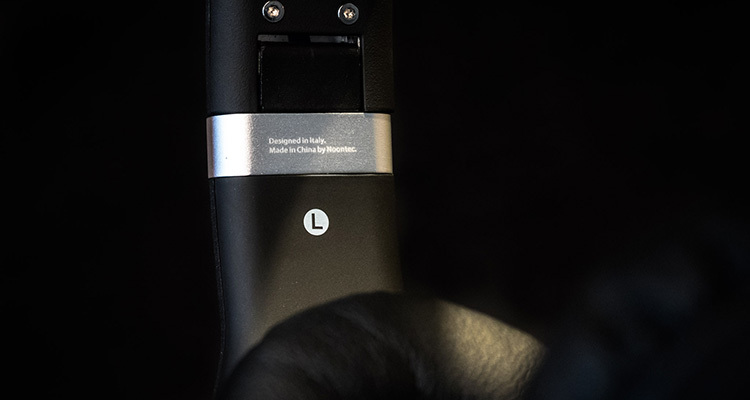 The hardware buttons for volume control, play/pause and power are distributed on both sides of the headset. They are placed at the lower back of the ear cups to easily control with your thumbs. On the right side, you can control volume up and down which will be confirmed with a small beep through the speakers. I am used to control everything with my right hand from the Bose QC 35, but the play/pause/power button moved to the left side along with the LED indicators. The cable is flat and rubberized with a 3.5mm termination on each side. But that doesn’t matter since you won’t be needing it. 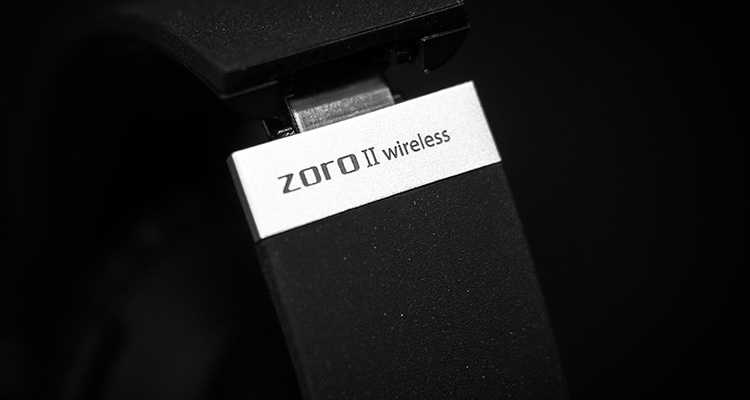 If you want, you can use the Zoro II Wireless passively with a cable, though. But not only is a wireless connection very convenient, the built-in battery seems to last forever. Noontec claims 35 hours. While I haven’t used a stop watch to confirm that, I can say that I have used these a lot (1 hour every day over 20 days) and the iPhone still showed me over 50% remaining before I decided to recharge them overnight. The Z2VC use Bluetooth 4.0 instead of the newer 4.2. 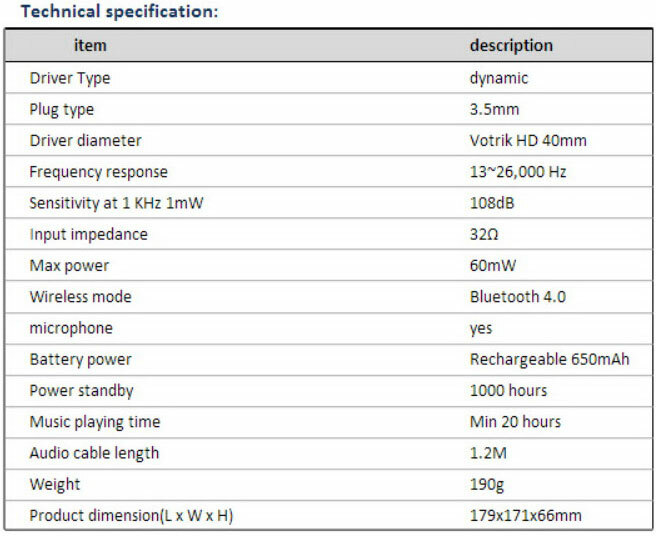 Bluetooth 5 has also been announced already, but nevertheless, during this review the bluetooth connection was totally reliable. The Z2VC can transfer data up to 10m. In my case, I could walk freely in my (small) apartment and tidy up my room while the phone was charging in the corner. Android devices can pair via NFC. As an iPhone user, pairing was easy as well. Though that does mean that I missed out on aptX compatibility since the iPhone standard uses AAC – which sadly is not supported by Noontec. I did use aptX on the MacBook, though, and I have to say that I couldn’t really tell a difference. Connections never broke off in either case. I never thought I would say this, but the convenience of bluetooth is amazing. Especially in winter when I can keep the phone in my inside jacket pocket and don’t have to get the cable in the way of the zipper. Controlling volume through hard buttons on the outside of the cups is also very easy to achieve and I did not have to take off my gloves at -6 °C. Oh, btw, they have a mic too and you can use them as a headset. 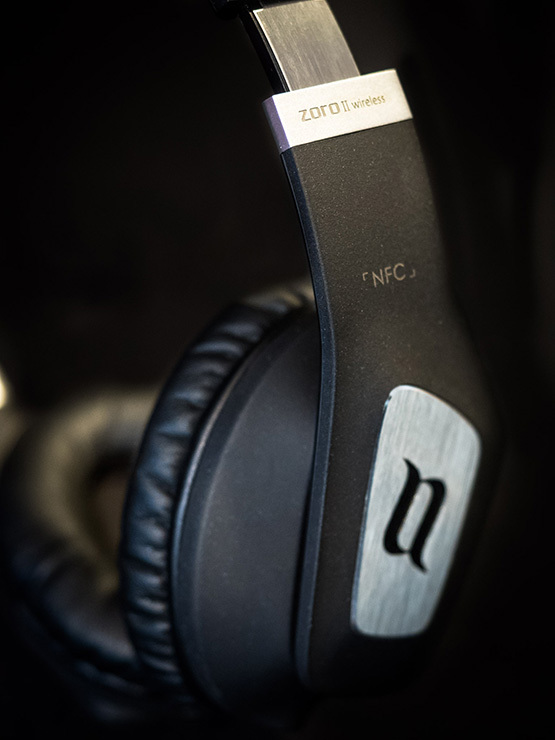 The Noontec Zoro II Wirless do not have active noise cancellation (ANC). As a closed on-ear design they “only” isolate passively. That is not a problem at this price point at all, considering ANC headphones start at 300+ USD. Passive isolation is not amazing, though. You will get better isolation from an HD 25-1 II or DT-1350. Isolation quality still beats that of the Beoplay H8 in passive mode. Not much has changed since the budget recommendation Zoro II HD. The tuning is still slightly warm with great transitions across all parts of the frequency range. Treble, starting from the upper midrange, is recessed just a bit to make non-optimal audio still sound enjoyable. The bass is relatively flat and extends far and dry all the way to the lowest octaves. This results in a very lively rendering without hurting speed. Neither punch nor boom stand out particularly. The Noontec will do well with any bass track and quantity will scale linearity with the source. The bass’ character focusses more on impact than texture, making it especially suitable for sports. Mids sound smooth and vivid. Male voices sound especially great. They are a bit too relaxed for studio monitoring, though, as they take a dive after 2 kHz. However, voices do not sound veiled, just somewhat muffled when compared to reference monitors. This keeps them from sounding aggressive and allows the user to turn up the volume without having his ears start to bleed. Treble picks up after 4 kHz again and linearly ascends to 8-10 kHz. There are no noteworthy peaks in the treble that could cause either fatigue or strong coloration. The treble as a whole is just very smooth. Treble quantity is not enough to fully balance the bass or warm mids, but due to a very solid extension, the amount of air is pleasing, helps with the separation and keeps the Z2VC from sounding dark. 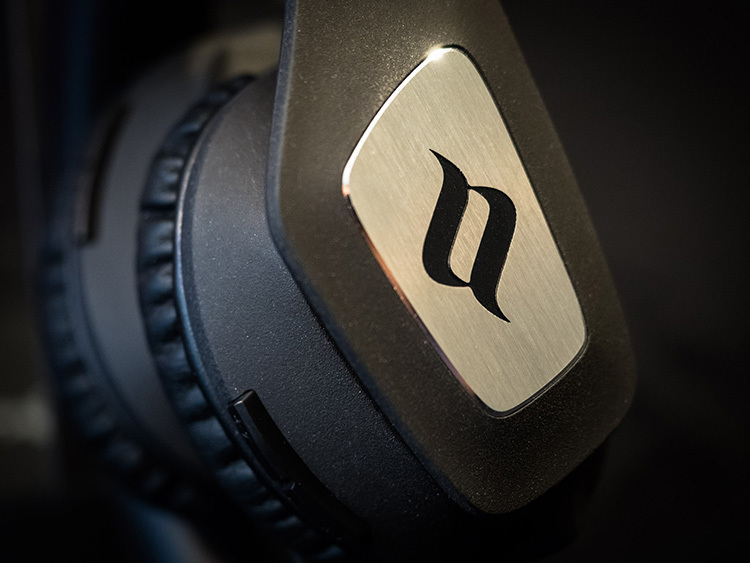 On-ear headphones are always challenged by the request for a big soundstage. The Z2VC are no different. While layering and separation works fine, the overall width and depth of the soundstage is nothing to write home about. The Noontec have great detail retrieval. However, this is largely based on the smooth transitions in the tuning that allow high clarity. No instrument sticks out in particular and the whole presentation comes together nicely. Going by pure speed, the Zoro 2 performs adequately with good PRaT and decays of cymbals. The driver is not especially fast, though. Well, you’d be a fool not to use Bluetooth. So the sound quality performance is independent of the source. Amplification is handled within the headphones so luckily you can save your money and don’t have to spend much on external DACs and amps. Ideally, you want to use a device with full aptX and NFC technology support. But I will say this, it also works very well with an Apple iDevice. Using the Wireless Volcanic Rock without bluetooth basically gives you the Zoro 2 as previously reviewed. At first, I was of the impression that turning on bluetooth does result in a very small sonic boost. After A/B switching and matching the volume levels on the iPhone, I cannot confirm this anymore. Sonically, these are the same headphones. But worlds drift apart when comparing build quality. The Volcanic Rock is an improvement of at least two classes and overlaps that of the Beats Solo 2. Noontec no longer provides a target for my criticism. 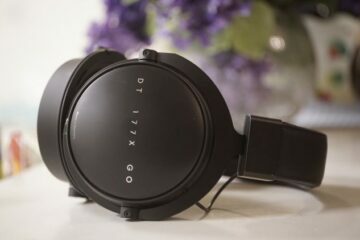 Sure, there is always room for improvement and on-ear designs are not necessarily the most comfortable, but within the price range, my hands are tied. I am basically forced to recommend the Volcanic Rock Limited Edition! The Bose cost more than twice as much as the Z2VC. 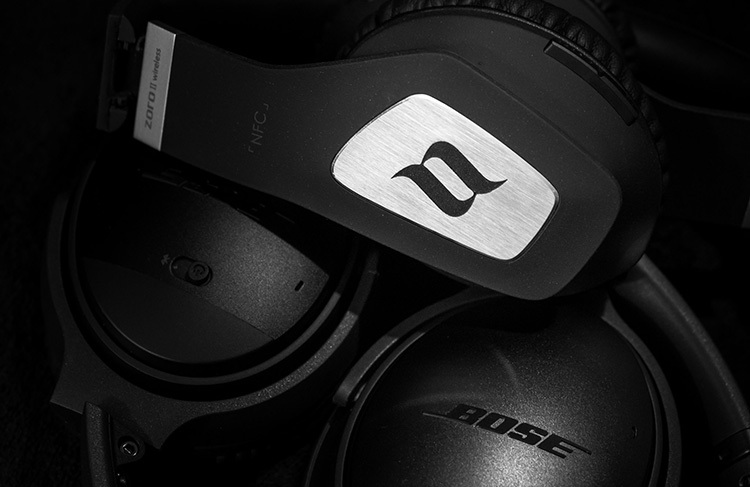 The price difference comes with two advantages: One, the Bose have ANC and two, they are over-ear headphones. The latter might arguably not be considered as a positive, especially since some people complain about the suction of the Bose ear pad design. The QC35 (active) are a bit more v-shaped than the Noontec and it quickly shows in the strongly colored treble. The Z2VC render instruments much better with a more realistic timbre. Neither set of headphones are the audiophile crème de la crème in terms of resolution, but the Zoro 2 are tighter in the bass and have faster decay in the treble. 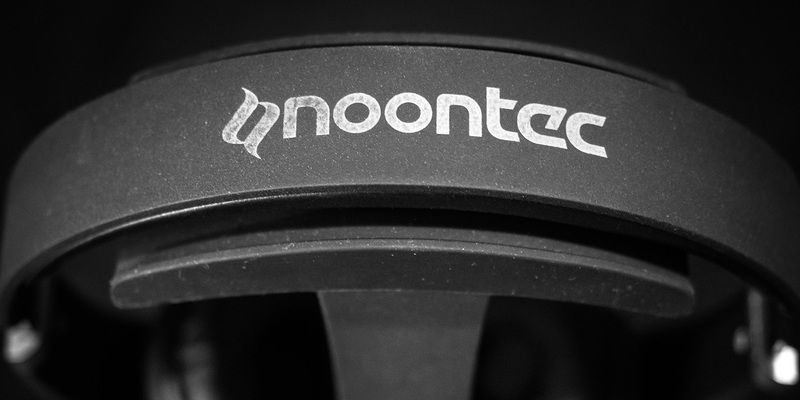 Simply put, I rate the Noontec Zoro 2 Wireless as the technically superior headset. How to improve your products 101: sit down and take notes, Noontec is offering you a free course. The new Volcanic Rock limited edition is exactly what I was thinking of when I reviewed the Zoro II HD. The build quality improvement is huge and the company finally has something unique. I can now fully recommend the Zoro 2 as a great wireless allround on-ear headset – either for sports or daily music listening. Battery life is amazing and the sound quality is satisfyingly ambitious for a consumer headphone. I have to admit; I am a little irritated by the “limited edition” tag. Please, Noontec, do not drop the abrasive ABS build. This has to become your thing. I am hoping this will be the new default with your upcoming products.